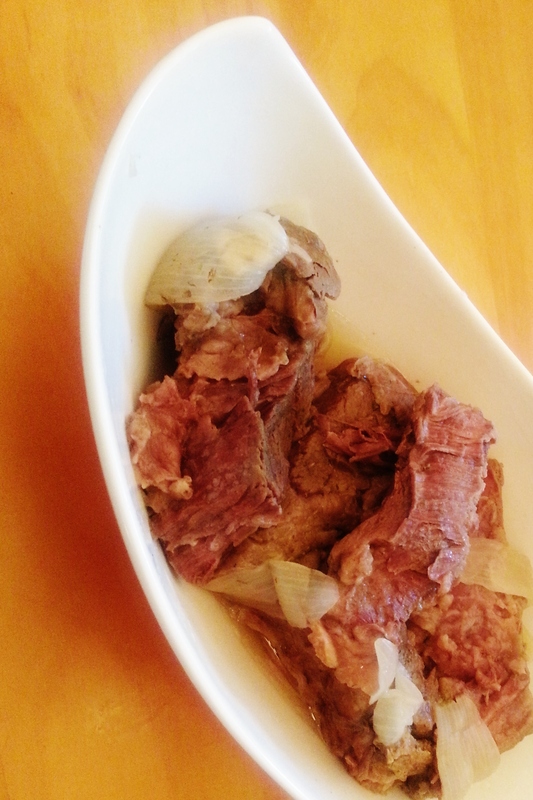 A lot of people feel intimidated about making a pot roast because the meat can end up being tough and stringy. I buy bulk “bundle packs” from my local butcher, and some of them include 3lb chuck roasts. I have tried several different ways of making them, but this is my #1 way to make it. Spoiler alert, I boil it (and it is delicious!) I do not sear it or roast it, and most times I plop the roast in the pot frozen. (Cooking frozen meat is fine, as long as you let it cook a little longer, and check the temperature with a meat thermometer.) It really can’t get any easier. A stock pot that will hold your roast. Stock. I make my own when I can, but I also buy organic stock in bulk to have on hand. I use 4 cups of stock, (it doesn’t have to be beef stock either, I use vegetable stock, or chicken stock too, it’s just extra flavor.) Then add enough water to cover the top of the roast. I like to add something acidic to tenderize the meat, and I switch it up often. Try a shot of bourbon, or half a cup of red or white wine. You could use a little vinegar, but proceed with caution as it can overpower a dish pretty quick. Have fun, and again, use what you have when you can! Add a teaspoon or so of salt. Some stocks are saltier than others, so use salt sparingly as you can always add more, but you don’t want to overdo it. – Add some pepper too. Put all of the ingredients in to your stock pot on a large burner on your stove top. Let it come up to a boil on medium high heat (or just below the highest setting.) Once it has gotten to a good rolling boil, start to decrease the temperature little by little. (I usually do laundry or homework in-between checking.) Bring the roast down to the lowest setting you can where it will simmer. If you go too low, turn it back up. Keep the lid on it and check it periodically to make sure it isn’t boiling too high. Add water as necessary to keep the roast just covered while cooking. It will take a good 2-3 hours of cooking, but I start it in the morning and let it go slow and low all day. I think it’s better than any scented candle you can buy!